To start with, I have listed the kanji you will need for the vocabulary for your convenience. The link will take you to a diagram of the stroke order. I recommend practicing the kanji in the context of real words (such as the ones below). In this second exercise, we are really going to test your conjugation knowledge as well as the vocabulary by translating some simple English sentences. this creates a very firm and declaratory tone. In this last exercise, we’ll practice answering very simple questions using the state-of-being. The yes or no answer （うん or ううん） will be given and it is your job to complete the sentence. In deciding whether to use the declaratory 「だ」, I’ve decided to be sexist here and assume all males use the declaratory 「だ」 and all females use the implicit state-of-being (not the case in the real world). We want to now make good use of what we learned in the last lesson by associating a noun with another noun. This is done with something called particles. 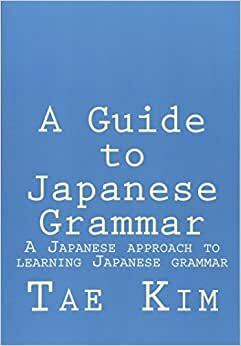 Particles are one or more Hiragana characters that attach to the end of a word to define the grammatical function of that word in the sentence. Using the correct particles is very important because the meaning of a sentence can completely change just by changing the particles. For example, the sentence “Eat fish.” can become “The fish eats.” simply by changing one particle. The first particle we will learn is the topic particle. The topic particle identifies what it is that you’re talking about, essentially the topic of your sentence. Let’s say a person says, “Not student.” This is a perfectly valid sentence in Japanese but it doesn’t tell us much without knowing what the person is talking about. The topic particle will allow us to express what our sentences are about. The topic particle is the character 「は」. Now, while this character is normally pronounced as /ha/, it is pronounced /wa/ only when it is being used as the topic particle. Here, Bob is indicating that his question is about Alice. Notice that once the topic is established, Alice does not have to repeat the topic to answer the question about herself. Since we have no context, we don’t have enough information to make any sense of this conversation. It obviously makes no sense for John to actually be tomorrow. Given a context, as long as the sentence has something to do with John and tomorrow, it can mean anything. For instance, they could be talking about when John is taking an exam. The last example shows how generic the topic of a sentence is. A topic can be referring to any action or object from anywhere even including other sentences. For example, in the last sentence from the previous example, even though the sentence is about when the exam is for John, the word “exam” doesn’t appear anywhere in the sentence! We’ll see a more specific particle that ties more closely into the sentence at the end of this lesson with the identifier particle. Another particle that is very similar to the topic particle is the inclusive topic particle. It is essentially the topic particle with the additional meaning of “also”. Basically, it can introduce another topic in addition to the current topic. The inclusive topic particle is the 「も」 character and its use is best explained by an example. The inclusion of 「も」 must be consistent with the answer. It would not make sense to say, “I am a student, and Tom is also not a student.” Instead, use the 「は」 particle to make a break from the inclusion as seen in the next example. Ok, so we can make a topic using the 「は」 and 「も」 particle. But what if we don’t know what the topic is? What if I wanted to ask, “Who is the student?” What I need is some kind of identifier because I don’t know who the student is. If I use the topic particle, the question would become, “Is who the student?” and that doesn’t make any sense because “who” is not an actual person. This is where the 「が」 particle comes into play. It is also referred to as the subject particle but I hate that name since “subject” means something completely different in English grammar. Instead, I call it the identifier particle because the particle indicates that the speaker wants to identify something unspecified. Bob wants to identify who among all the possible candidates is a student. Alice responds that John is the one. Notice, Alice could also have answered with the topic particle to indicate that, speaking of John, she knows that he is a student (maybe not the student). You can see the difference in the next example. However, they only seem similar because English cannot express information about the context as succinctly as Japanese sometimes can. In the first sentence, since 「私」 is the topic, the sentence means, “Speaking about me, I am a student”. However, the second sentence is specifying who the 「学生」 is. If we want to know who the student is, the 「が」 particle tells us it’s 「私」. You can also think about the 「が」 particle as always answering a silent question. The second sentence might be answering a question, “Who is the student?” I often translate the topic particle as “as for; about” and the identifier particle as “the one; the thing” to illustrate the difference. The 「は」 and 「が」 particles are actually quite different if you think of it the right way. The 「が」 particle identifies a specific property of something while the 「は」 particle is used only to bring up a new topic of conversation. This is why, in longer sentences, it is common to separate the topic with commas to remove ambiguity about which part of the sentence the topic applies to. *Well technically, it’s the most likely translation given the lack of context. *Note: The order of topics covered are different in the videos so you may want to read about Adjectives first. Let’s first get used to the basic concept of particles by making some very simple sentences with them. In this first exercise, we are going to use the topic particle to explain the current topic of conversation. Remember, the topic particle 「は」 is always pronounced as /wa/. Now that we can connect two nouns together in various ways using particles, we want to describe our nouns with adjectives. An adjective can directly modify a noun that immediately follows it. It can also be connected in the same way we did with nouns using particles. All adjectives fall under two categories: na-adjectives and i-adjectives. Here, the entire clause 「魚が好き」、「魚が好きじゃない」、etc. is modifying “person” to talk about people that like or dislike fish. You can see why this type of sentence is useful because 「人は魚が好きだ」 would mean “People like fish”, which isn’t always the case. Person who likes fish also likes vegetables. All i-adjectives always end in the Hiragana character: 「い」. However, you may have noticed that some na-adjectives also end in 「い」 such as 「きれい（な）」. So how can you tell the difference? There are actually very few na-adjectives that end with 「い」 that is usually not written in Kanji. Two of the most common include: 「きれい」 and 「嫌い」. Almost all other na-adjectives that end in 「い」 are usually written in Kanji and so you can easily tell that it’s not an i-adjective. For instance, 「きれい」 written in Kanji looks like 「綺麗」 or 「奇麗」. Since the 「い」 part of 「麗」 is part of a Kanji character, you know that it can’t be an i-adjective. That’s because the whole point of the 「い」 in i-adjectives is to allow conjugation without changing the Kanji. In fact, 「嫌い」 is one of the rare na-adjectives that ends in 「い」 without a Kanji. This has to do with the fact that 「嫌い」 is actually derived from the verb 「嫌う」. Remember how the negative state-of-being for nouns also ended in 「い」 （じゃない）? Well, just like the negative state-of-being for nouns, you can never attach the declarative 「だ」 to i-adjectives. Now that we got that matter cleared up, below are the rules for conjugating i-adjectives. Notice that the rule for conjugating to negative past tense is the same as the rule for the past tense. Note that you can make the same type of descriptive noun clause as we have done with na-adjectives. The only difference is that we don’t need 「な」 to directly modify the noun. Don’t like high price restaurants very much. There is one i-adjective meaning “good” that acts slightly differently from all other i-adjectives. This is a classic case of how learning Japanese is harder for beginners because the most common and useful words also have the most exceptions. The word for “good” was originally 「よい（良い）」. However, with time, it soon became 「いい」. When it is written in Kanji, it is usually read as 「よい」 so 「いい」 is almost always Hiragana. That’s all fine and good. Unfortunately, all the conjugations are still derived from 「よい」 and not 「いい」. This is shown in the next table. We are now going to practice the adjectives conjugations in order. Take each adjective and conjugate it to the following forms: the declarative (when applicable), negative, past, and negative past. In order to emphasize the fact that you can’t use the declarative 「だ」 with i-adjectives, you should just write “n/a” (or just leave it blank) when a conjugation does not apply. Now that we’ve practiced the basic conjugations for adjectives, we are going to practice using them in actual sentences using the particles covered in the last section. We’ve now learned how to describe nouns in various ways with other nouns and adjectives. This gives us quite a bit of expressive power. However, we still cannot express actions. This is where verbs come in. Verbs, in Japanese, always come at the end of clauses. Since we have not yet learned how to create more than one clause, for now it means that any sentence with a verb must end with the verb. We will now learn the three main categories of verbs, which will allow us to define conjugation rules. Before learning about verbs, there is one important thing to keep in mind. Or to rephrase, unlike English, the only thing you need to make a grammatically complete sentence is a verb and nothing else! That’s why even the simplest, most basic Japanese sentence cannot be translated into English! Before we can learn any verb conjugations, we first need to learn how verbs are categorized. With the exception of only two exception verbs, all verbs fall into the category of ru-verb or u-verb. All ru-verbs end in 「る」 while u-verbs can end in a number of u-vowel sounds including 「る」. Therefore, if a verb does not end in 「る」, it will always be an u-verb. For verbs ending in 「る」, if the vowel sound preceding the 「る」 is an /a/, /u/ or /o/ vowel sound, it will always be an u-verb. Otherwise, if the preceding sound is an /i/ or /e/ vowel sound, it will be a ru-verb in most cases. A list of common exceptions are at the end of this section. Below is a list of u-verbs with a preceding vowel sound of /i/ or /e/ (“iru” or “eru” sound endings). The list is not comprehensive but it does include many of the more common verbs categorized roughly into three levels. There’s really not much to do at this point except to practice classifying verbs as either a ru-verb or an u-verb. You can also take this opportunity to learn some useful verbs if you do not know them already. We’ll learn how to conjugate these verbs according to their category in the next few sections. In the chart below, you should mark whether the given verb is either an u-verb or a ru-verb. The first answer is given as an example of what you need to do. Obviously, verbs that do not end in 「る」 are always going to be u-verbs so the tricky part is figuring out the category for verbs that end in 「る」. Remember that verbs that do not end in “eru” or “iru” will always be u-verbs. While most verbs that do end in “eru” or “iru” are ru-verbs, to make things interesting, I’ve also included a number of u-verbs that also end in eru/iru. Though you do not need to memorize every word in the list by any means, you should at least memorize the basic verbs. Now that we’ve seen how to declare things and perform actions with verbs, we want to be able to say the negative. In other words, we want to say that such-and-such action was not performed. This is done by conjugating the verb to the negative form just like the state-of-being for nouns and adjectives. However, the rules are a tad more complicated. We will now make use of the verb classifications we learned in the last section to define the rules for conjugation. But before we get into that, we need to cover one very	important exception to the negative conjugation rules: 「ある」. 「ある」 is an u-verb used to express existence of inanimate objects. The equivalent verb for animate objects (such as people or animals) is 「いる」, which is a normal ru-verb. For example, if you wanted to say that a chair is in the room, you would use the verb 「ある」, but if you wanted to say that a person is in the room, you must use the verb 「いる」 instead. These two verbs 「ある」 and 「いる」 are quite different from all other verbs because they describe existence and are not actual actions. You also need to be careful to choose the correct one based on animate or inanimate objects. Anyway, the reason I bring it up here is because the negative of 「ある」 is 「ない」 (meaning that something does not exist). The conjugation rules for all other verbs are listed below as well as a list of example verbs and their negative forms.